Laura Bang, who recently earned her master’s degree in library science from the University of Maryland, has joined Falvey Memorial Library as a curatorial assistant in Special and Digital Collections. Laura will hire, train and supervise students and staff in the Digital Library. She will also help develop and mount the Special Collections’ online and physical exhibits and catalog Special Collections’ acquisitions. 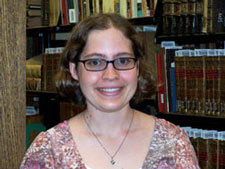 Laura will also serve on the Humanities/Social Sciences liaison team. Her hobbies are reading, baking and photography. Laura said she “is excited to be here” at Villanova.